What is perhaps one of the most unusual phenomenon regarding the bodies of Saints is that of the miraculous preservation of a great number of them after being interred for years in conditions that normally should have provoked their destruction according to the laws of nature, and even more so because in almost every case of incorruption in the lives of the Saints the bodies were not embalmed or preserved in any way. Yet in spite of not being embalmed or treated in any fashion, the bodies of “the incorruptables” as they are called, have remained lifelike, flexible and often sweetly scented many years after their death. Many are now displayed under altars in glass-fronted reliquaries, to the admiration and wonder of countless people. Human remains decompose according to natural laws, and moisture in the body along with the environment of the tomb in which the remains are placed is the primary factors that influence the decomposition of the body. Regardless of these influences, the body will begin decomposition immediately after death, and will continue to decompose in the days, weeks and months afterwards, regardless of the preservation methods (or lack thereof) that are used, although those preserved will normally decompose at a slower rate. Nevertheless decomposition cannot normally be completely inhibited, regardless of the preservation methods used. Nevertheless, the bodies of numerous Saints have survived decomposition for decades and even centuries. Even more remarkably, there are even a couple of circumstances where the holy remains were subjected not only to normal conditions of burial, but to the appli¬cation of quicklime, and even one’s whose mutilated body was subjected to torturous conditions which in reality should have hastened the body's destruction. There are, in fact, several hundered confirmed and documented cases of incorruption in the Catholic church. 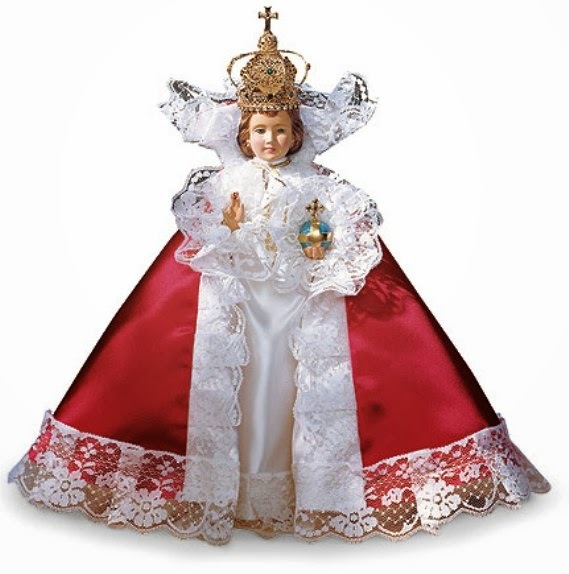 Many are canonized Saints or Blesseds, however some are simply considered holy persons. Lists of many of these can be found on the internet. What will be presented here is a very recent and well documented case of incorruption that occurred in modern times concerning the holy Catholic monk of the Maronite rite, St. Charbel Makhlouf (1828-1898). Charbel Makhlouf(sometimes spelled Sharbel) was born on May 8, 1828, in the village of Biqa-Kafra in the high mountains of Northern Lebanon. He was given the name of Joseph at his baptism, and he was the last of the five children born to very poor but religious parents. From early childhood he showed a strong attraction to prayer and solitude, and at age 23 he left home to become a monk in the Monastery of St. Maroun at Annaya. After being received into the novitiate, he was given the name Charbel, the name of an early martyr. After the usual theological and secular studies, he was ordained a priest on July 23, 1859 and was assigned to the Monastery of St. Maroun, where he spent sixteen years with his fellow bretheren, living a communal life of prayer and devotion to God. In 1875 he received the permission of his superiors to live alone in a private hermitage named Saints Peter and Paul, which was not far from the monastery, and which was used by the priests during days of quiet personal retreat. It was a rugged and simple cabin, with poor heat and the bare necessities of life. It was in this secluded sanctuary that he spent the remaining twenty-three years of his life in the practice of severe scarifices and mortification. 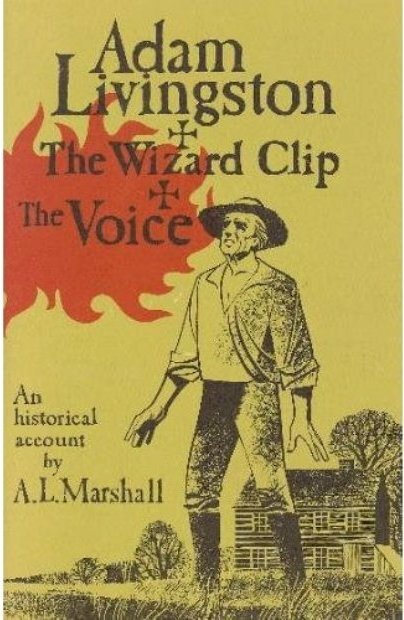 It is recorded by his companions that he often wore a hair shirt, slept on the hard ground, and ate only one meal a day. 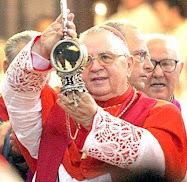 During his lifetime he was most notable for his remarkable devotion to the Holy Eucharist and his preference for saying daily Mass at 11:00 a.m., so he could spend almost all the morning in preparation for the Mass, and the rest of the day in thanksgiving afterwards. 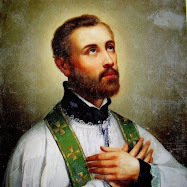 After 23 years of daily sacrifice in such a meager existence, in 1898 he suffered a seizure while saying Mass, and a priest assisting at the Holy Sacrifice was forced to pry the Holy Eucharist from his grasp. The holy monk died eight days later on Christmas Eve at the age of seventy. He was buried very simply in the monastery cemetery where so many saintly monks before him had been buried. According to monastic custom, the body, which was not embalmed, was dressed in the full habit of the Order and was placed into the ground without a coffin. Given such a hidden existence, he would most certainly have been forgotten had not a most extraordinary phenomenon occurred at his grave in the form of an extraordinary bright light, which surrounded his tomb for forty-five nights following the interment. Countless local townspeople saw the miraculous light and because of it and the enthusiasm of the many witnesses of this prodigy, the officials of the monastery requested permission from the ecclesiastical authorities to exhume the body four months after the saint's death. On the day of the exhumation, his grave was opened in the presence of the superiors of the Order, the monks of the monastery, and many villagers, the body was miraculously found in perfect condition to the amazement of everyone, even though, as the result of frequent rains which had inundated the cemetery several times since the burial, the body was found floating on mud in a flooded grave. Given that St Charbel was buried in the ground without a casket and in very wet conditions, such circumstances certainly should have expedited decompostition. 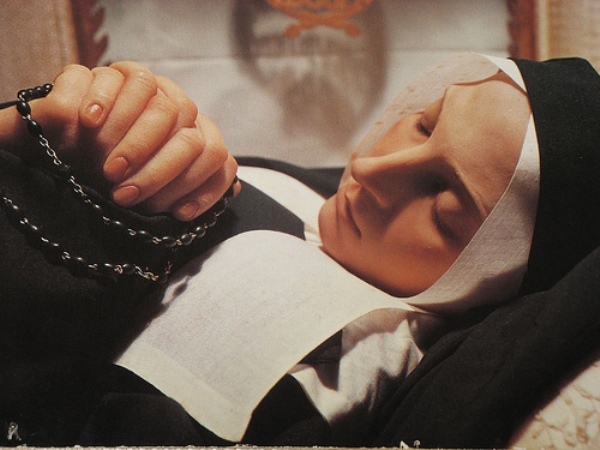 After being cleansed and reclothed in fresh garments, the body was reverently laid in a wooden coffin and placed in a corner of the private chapel of the monastery for the admiration and contemplation of the monks and the faithful. Additionally, a remarkable phenomenon accompanied this exhumation; from the pores of the body there exuded a liquid described as perspiration and blood, which had the distinct odor of blood. As a result of this transpiration, the blood-stained clothing upon his person was changed twice a week. Small pieces of this cloth soaked in this mysterious fluid are distributed as relics and these have been said to effect cures. "I have always been astonished at its state of preservation and espe¬cially this reddish liquid exuded by it. .. My personal opinion based on study and experience, is that this body is preserved by a supernatural power." The phenomenon is more astounding when one considers that in 1918, following a simple autopsy, the body was exposed on the terrace during the heat of summer for three months without the body decomposing and without drying up the source of the fluid. 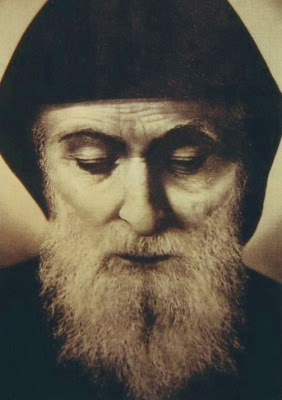 On July 24, 1927, after the body of Father Charbel was minutely examined by two physicians of the French Medical Institute at Beirut, it was clothed in sacerdotal garments and was placed in a new coffin of wood covered with zinc. Various documents drawn up by the physicians, the Judge of the Ecclesiastical Commission, the Defender of the Faith, a notary and superiors of the Order, were placed in a zinc tube, which was firmly closed and placed beside the body. Then, after it was sealed with the episcopal crest of the Commission, the coffin was placed in a new tomb especially prepared in the wall of an oratory. The coffin was placed on two stones to prevent contact with the dampness of the soil, and after being carefully sealed with masonry, the tomb was left undisturbed for twenty-three years. On February 25 of the Holy Year 1950, pilgrims to the shrine noticed a liquid seeping from a corner of the tomb and flowing onto the floor of the oratory. The father superior of the monastery, on exam¬ining the liquid and fearing damage to the contents of the tomb, had it opened in the presence of the assembled community. The tomb was found dry and the coffin in the same condition as when it was placed in position, except that a reddish colored liquid was seen dripping through a crack in the foot of the casket. Permission to examine the contents of the sealed casket was ob¬tained, and in the presence of many ecclesiastical authorities, offi¬cials of the Order and attending physicians, the seal was broken on April 22, 1950. The body was once again found completely free of any trace of corruption and was perfectly flexible and lifelike. The sweat of liquid and blood continued to exude from the body, and the garments were found stained with blood, the white content of the fluid having collected on the body in an almost solidified condition. Part of the chasuble had rotted and the zinc tube containing the official documents was covered with corrosion. And so it was for 67 years in modern times that the body of Saint Charbel remained perfectly preserved, the case itself be thoroughly documented and examined by medical professionals and described by all accounts as being supernaturally sustained during this 67 year period. For reasons known only to Himself, God chose not to continue the miracle, and at the time of the beatification in 1965, the body was found to have finally complied with the laws of nature. Today, only his bones remain, and these are of a red color, and the discharge of the fluid has ceased. -“A Miraculous Star in the East, Charbel Makhlouf” by Paul Daher, published by the Monastery of St. Maron. Annaya-Djebeil, Lebanon 1952. -“The Incorruptables” by Joan Carroll Cruz, 1977, Tan Books. ***Support this website! Visit the Mystics of the Church Gift Store for rosaries, lockets and books! st. charbel, pray for us!!! - long live the roman catholic faith!!! Ok. Here goes. I am a 51 yr old American female. I am a widow, a mother of grown sons, a grandmother, an RN for many years, etc. I am a Christiam. I am not Catholic but I find it to be a beatiful religion. I think I have had in my possession for almost 10 years a miracle in the form of an object which came into being shortly after the sudden death of my husband Francisco in 2001. I keep feeling that God is prodding me to take this object to a member of the Catholic Church for examination and maybe even an explaination as to how this object came to be. What who where do I go from here. Any thoughts. My email is roziesr1@gmail.com. I am Roseanne. To answer your question, I would suggest that you contact a local priest at a Catholic church in your area. You can either call or send an email---most all Catholic churches nowadays have websites with an email address of the pastor. The pastor will probaly have some suggestions and perhaps can provide you with some more information. Am I a victim' soul? I have prayed and begged for the conversion of my 4 children. Mostly 2, my 41yr daughter who turned my mother against me 15 yrs before my mother s death, had an abortion from my exhusband, who was her stepfather at the time, and who has turned my 22yr old son against me. My son was an alterer for many yrs and graduated from a fine catholic school. Now he has hit me and ran off with a 45yr old woman who has abandoned her 3 children. Under the influence of his older sister,my son wants nothing to do with me..my heartache is unbearable and I am losing my faith. i have prayed and asked God to bring them back to me. My family is all I have ever prayed for, for myself. The more I ask, the worse its gets.My sister and my 1st husband comitted adultry against me. 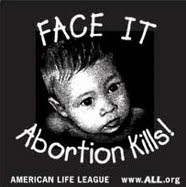 My 2nd husband and my oldest daughter had an affair which resulted in abortion when my daughter was 26yrs old. Later my husband molested our little daughter and he went to prison for only 6yrs. The story of my life is pitiful and tooooo long to print here. HELP ME, IF THERE REALLY IS GOD, PLEASE BRING ME BACK. THAT IS JUST A TID BIT OF MY LIFE..THERE IS TONS OF THINGS THAT HAS HAPPENED TO ME. GOD KNOWS I DIDN'T ASK FOR. I DON'T UNDERSTAND IT. I READ IN A PRAYER BOOK ASK AND YOU SHALL RECEIVE. I HAVE ASKED, PRAYED, AND BEGGED AND IT ONLY GETS WORSE..SOMEONE TOLD ME I AM A VICTIM'S SOUL..CAN THIS BE TRUE? HOW DO I KNOW? HOW CAN I FIND OUT SO THAT IF I AM I CAN LREAN TO UNDERSTAND? It is obvious that you have suffered very deeply in your life, much of which is through the weakness and faults of others. Something I think that you might want to consider is the fact that God gives each person free will to choose their path and make decisions in life that often effect others for better or for worse. Obviously in your case many of the decisions that those close to you have made have been very sinful and have caused you alot of pain and suffering. And you have done well to continue to pray for these loved ones and persons in your life that have hurt you. And they need not only your prayers, but also your forgiveness. God desires that we always forgive others, and without a doubt this can be very, very difficult. But we can obtain many graces from God when we forgive others out of love for Him. You feel that God is not answering your prayers. I assure you, in His name, that this is NOT the case. You have to remember that with the free will that God has given us comes a very great responsibility to make good, moral decisions in life. Obviously your loved ones have made some very poor and sinful decisions, and you have often prayed for them that they might repent and change their sinful ways. The thing is is that we are completely unable to change someones free will and the decisions that they make. Not even God Himself will infringe upon someone's free will. We are all free to choose good or evil, right or wrong, and God will not force anyone...He will, however, provide many, many means of grace and inspiration for each person to make the right decisions, but it is up for the person to choose to do so. So when you pray for your loved ones, you obtain for them light from God for them to make good decisions, and also light to see their past sins and repent and seek forgiveness for them, if they choose to do so. Repeated sinfulness can spiritually blind a person, and when we pray for them we obtain light and grace from God for them, yet they are always free to choose to benefit from this light and grace, or not. So you see, God has heard all of your prayers for your loved ones, and all the desires of your heart for them, and He desires that you forgive them of all their faults and sins that they have committed against you, if you have not already. By forgiving them you will obtain many graces for them from the Heart of God, and it is very possible that it can be through your forgiveness that God will grant them the necessary graces for their salvation. This is the mystery of our share in the passion of Jesus and His redemption. May God bless you and may He draw you and your loved ones ever closer to Himself. I enjoyed learning about all the miracles and amazing occurrences that took place. I have been born and raised Catholic, and am only 19. It is hard to get by in this life with all the hateful and negative people who support abortion and look down on our Pope. But my faith gives me hope and assures me that I am doing right. I would really love to talk to someone and get advice. My email is jillianeliza@gmail.com God Bless. St Charabel, Please Intercede For My Moms Health, Quality Of Life, And Give Me Strength To Accept Your Will. st. charbel pray for t.l. that she may soon come back to church. St Sharbel pray for me that Tondera changes his mind and that I am paid what is due to me. Thank you St Sharbel. 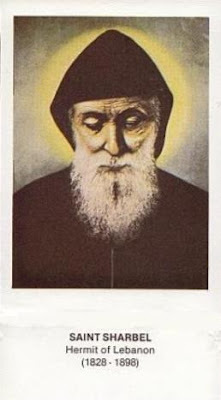 St. Charbel Makhlouf pray for us. Please, St. Charbel, through your intersession, please pray that my sister finds her way and is not swayed by the evil one. Please. She is so lost and so mixed up. Please help her to know that there is a better life for her than the path she is choosing, and that God has greater things in store for her. We, her family, are so distraught and so sad about the choices she is making. Please St. Charbel, help her to find her way. Amen. Please St Sharbel through your intersession let my body be cancer free and lump on back of heel be nothing serious and go away, , may my heart and blood pressure be ok and let my panic attacks when I do have to seek medical attention get better , please let me live a long life as aim grateful for everyday the lord gives me , thankful I can wake up everyday in my own bed without a hospital or operating room in my life . Please St Sharbel through your intersession let my friend Jim Quit drinking or at least slow down , may his liver and health be good and protect him . Pease save my marriage and protect my wife. Please pray to save my marriage, protect my wife and loved ones, and that God will grand my wife and I longevity, health, peace, strong faith in Jesus, and Grace to help others find peace and faith. I also pray to have my body and my wife's restored to perfect health. 12 Very truly I tell you, whoever believes in me will do the works I have been doing, and they will do even greater things than these, because I am going to the Father. 13 And I will do whatever you ask in my name, so that the Father may be glorified in the Son. St. Sharbel. Pray for my son Matthew. Please intercede for Mary's daughter, our family, grandchildren and all those that have asked for our prayers especially those having marriage difficulties. St. Sharbel, please intercede for my daughter, guide her, strengthen her, and give her the wisdom she needs to make good decisions about her relationships. And help me to forgive her and love her. St Sharbel please intercede for my brother who is working overseas but with poor working conditions to be able to come back to our country to reunite to his family. Because of his type of work he is unable to participate in the Holy mass every Sunday. May he be able to find work in our home country. A work that will provide for his familys needs. Thank you. Please pray for my deliverance from alcohol & also for my daughter to get help. Protect my children - grandchildren & great grandchild. Pray we make good choices, & lead a blessed life. I love Christ and St Sharbel. Also deliver me from depression. May the souls of my departed loved ones be in Heaven. Please St Sharbel my family needs You. I need a miracle healing from my terrible addiction to alcohol. Soften my granddaughters heart that she allows me to talk to my great grandchild Also please deliver muito daughter from drug addiction. Bless my nephews to break free from drug addictiin and bless my family with faith and good health. I don't know what to think of things like this. Maybe they happen, but I suspect if a rigorous scientific investigation were undertaken, a sensible explanation for such phenomena would be discovered. I also allow for the possibility that certain things are as yet out of the reach of contemporary science. It wasn't too many centuries ago that the tale of rocks following from the sky was ridiculed as impossible. Today we call those rocks "meteroids." Why do people flock after stories of "incorrupt" saints whose bodies "bleed" sweet smelling fluid? Micah 6:8 says it all: "He has told you, O mortal, what is good;and what does the Lord require of you but to do justice, and to love kindness,and to walk humbly with your God?" Why is that not enough beauty and wonder to inspire people to flock to the living God? Or read the account in John 20 of Mary Magdalene going to the empty tomb on that first Easter morning, while it was still dark. THERE is wonder and mystery and depth which can be plumbed for all of one's life. I am not a fundamentalist or literalist, nor am I a "Catholic hater." As a matter of fact, I have two graduate degrees in theology from respected Roman Catholic universities. The Middle Ages is over, and most people, at least in the western world, can read and many have high school diplomas. Why encourage such spectacles? Invite people to a deeper trust in God in Christ, through the Holy Spirit. Saint Sharbel would probably thank you for it. Dear St Charbel. Help me in my problem,do not allow my enemies going against me,do no let's they doing bad things. Keep my family Happy together. Dear Saint Charbel, I humbly ask for your most precious intercession for my Healing of my sight that I lost 08/01/1990,from a stroke.I have hearing loss also with nerve damage that emits a continuous ringing/siren sound (ive missed the peace of silence since 1999). I also have Sjogrens syndrome and osteoarthritis and my knees are needing a replaced as soon as possible. I also have financial worries and a car that is 17 yrs old and on its last leg. Thank You St. Charbel for your intercession and my Lord Jesus especially with Our Blessed Mother's Love and protection. St. Charbel please help my family root strongly in faith. Through your intercession i ask for healing for my mom (65yrs) and my 5 year old daughter Joanna from psoriasis. Also, help me and my family always accept God's will.Amen. May God bless with all necessary graces all that read this post. Dear Saint Charbel please intervene for our prayers. Please pray for my health to be well again and also our financial crisis at the moment. I also pray that our family live in harmony. Peace for the whole world. That my eldest son this year will finish and succeed Senior year with God's grace. Healing of good health and soul, forgiveness, love, peace I pray. Amen. There is a God: his name is Yahoshua of Natzerat, seek him and give up all to him. He is your Salvation. 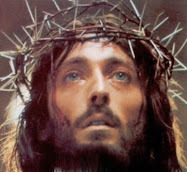 The West call him Jesus of Nazareth. You've been tested a lot but you need to keep the Holy family close to you and accept them as your true and loving family if you do this then you will be able to forgive everyone who has hurt you and you will get a great peace and grace. Dear St. Charbel, please pray for my daughter that the Lord God almighty may heal her from her inability to open her mouth as normal in the mighty name of Jesus Christ our Lord, Amen. Dear St. Charbel, thru the Immaculate Heart of Mary, by the merits won for us by our Lord JESUS Christ in his Incarnation,Passion and Resurrection, in union with the HOLY SPIRIT and by the Grace of GOD Almighty, I ask for your intercession and prayers for my deceased wife Leslie, my mother Eileen and my father Russell that they may obtain the beatific vision and spend eternity in Divine Love. I ask this in the name of the FATHER,the SON and the HOLY SPIRIT. Saint Charbel was Maronite not Roman Catholic.Im Maronite.